This mod was built with patch 1.42 and will not work on any lower patch level. This mod will conflict with any other mod that alters the giftPartyPileLarge OBJD resource in the FullBuild_p16.package (Seasons). This mod will conflict with Shimrod's Gift Pile in BuyDebug mod. Please use only one. Exact same polygon count as the EA object because this is the EA object. Note: The "Call Everyone" interaction will not appear if there is not enough space around the Gift Pile! 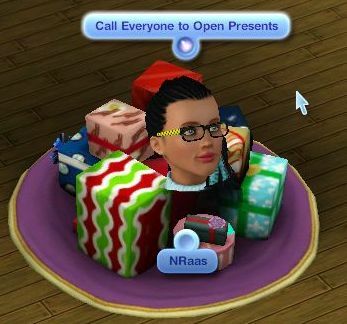 Make sure you leave enough room around the Gift Pile so sims can interact with the object. Feel free to ask for another flavor.